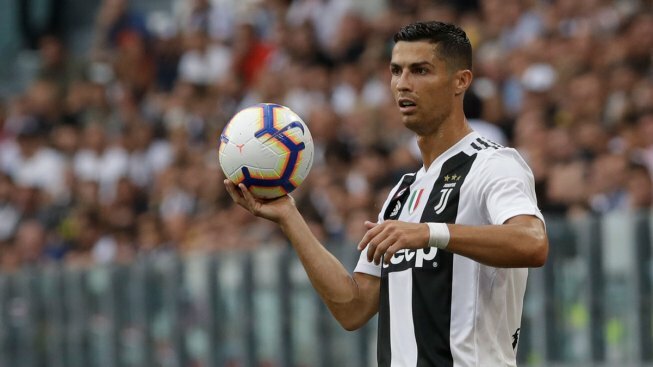 Juventus' Cristiano Ronaldo takes a throw in during the Serie A soccer match between Juventus and Lazio at the Allianz Stadium in Turin, Italy, Saturday, Aug. 25, 2018. Soccer star Cristiano Ronaldo is being sued by a Nevada woman who said he raped her in the penthouse suite of a Las Vegas hotel in 2009 and then dispatched a team of "fixers" to obstruct the criminal investigation and trick her into keeping quiet for $375,000. The woman refused to tell police where the assault took place or assist with identifying a suspect other than to say he was a European soccer player, the spokesman said. A Portuguese citizen, Ronaldo was transferred from Manchester United to Real Madrid in the summer of 2009 for a then-record sum of 94 million euros, or about $130 million. It asks for general damages, special damages, punitive damages and special relief, each in excess of $50,000, along with interest, attorney fees and court costs.